Home PGA Tour News Tiger Woods: What Does His Schedule Look Like Now? Next stop for Tiger Woods is most likely the Wells Fargo. Tiger Woods is taking some well-deserved time off following the Masters drama. Don’t look now but the majors are upon us really, really fast with this new compressed schedule. And that schedule sure doesn’t help a lot of PGA Tour events. There are rumors there’s an event at Hilton Head this week, yes the RBC and then that team bamboozle in New Orleans. For most of the top players, looks like a good chance to take a couple of weeks off and that’s what Woods will be doing. We’ll see Tiger again the week after New Orleans at the Wells Fargo, where they play on the big boy course — Quail Hollow — and that’s a nice warmup for Woods because guess what? The PGA is two weeks later. Woe to the Byron Nelson in Dallas, it falls the week before the PGA. Woods will take some time to visit Bethpage and reacquaint himself with the Black course. Woe to the Colonial — it falls the week after the PGA. Nothing like inserting a major between Dallas and Fort Worth — good way to avoid Texas. 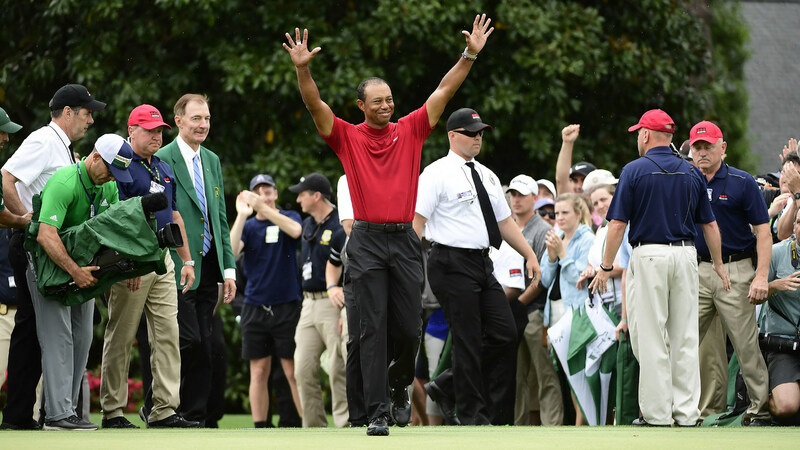 Woods, after the PGA, will re-appear at The Memorial where he can have a chat with Jack (Nicklaus) and discuss that re-emerging run to 18, maybe, perhaps, 19 majors. Jack will be his usual, cordial self. The Memorial is on another big-boy course, nice warmup for the U.S. Open at Pebble and guess what — it’s two weeks after Memorial. Tiger’s schedule is shaping up nicely. Woe to the Canadian Open, falls the week before the third major. Oh well, plenty of Canadians can get in this go-round. Which brings us to Pebble, a nice, big-boy course. And Tiger knows that one pretty well too. The only wildcard in this major season is the Open Championship at Royal Portrush. Tiger will have no advantage there and 50,000 well-lubricated Irish fans will be cheering their bellies off for Rory McIlroy. But by then, and it sounds pretty darn crazy, could Tiger Woods show up in Ireland going for the Grand Slam?